I'm hanging my head in shame this week because I never did get to any of your posts last week. I got home from my trip on Monday morning and hit the ground running to catch up with work. 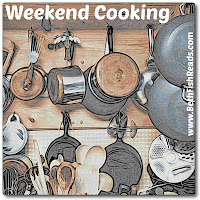 I will take time this weekend to read the Weekend Cooking posts from last week as well as the new ones from this week. When I spend time with my girlfriends, food often takes center stage. We do eat real meals, but there are also tons of baked goods, cheese and crackers, snacks, and chocolate. When I was finally in my own kitchen, cooking for just the two of us, I was craving veggies and light meals. Today, I'm sharing our favorite dinner of the week. Also on the menu this week was a chicken skillet dinner from Well Plated that was delicious, and I highly recommend you give it a try. Note, though, that I used only one apple because I didn't want the meal to be too sweet. I'm making updated tuna melts tonight (actually last night by the time you read this) from a new recipe. It's from Cooking Light, so I'm sure it will be delicious. This was a surprising winner. I think we could have eaten this whole salad in one sitting if we had let ourselves. It was just that good. I never thought I'd like raw kale so much. What's more, my husband is not usually a beet eater, but he happily ate this again for lunch the next day. Heat oven to 425F. Toss beets in 2 tablespoons of the olive oil and 1/8 teaspoon each of the salt and pepper. Seal beets inside a large piece of aluminum foil. Place foil-wrapped beets on a baking sheet and bake for 35 minutes or until knife-tender. Allow to cool a bit, then remove skins with a paper towel or gloves. Cut into 1/2-inch pieces. Meanwhile, make the dressing. In a medium bowl, combine vinegar, mustard, shallot, remaining 1/4 teaspoon salt and remaining 1/8 teaspoon pepper. Slowly whisk in remaining 1/3 cup olive oil. Toss kale with half the dressing. Arrange on a platter with beets, beans and apple. Scatter cheese on top and drizzle with remaining dressing. 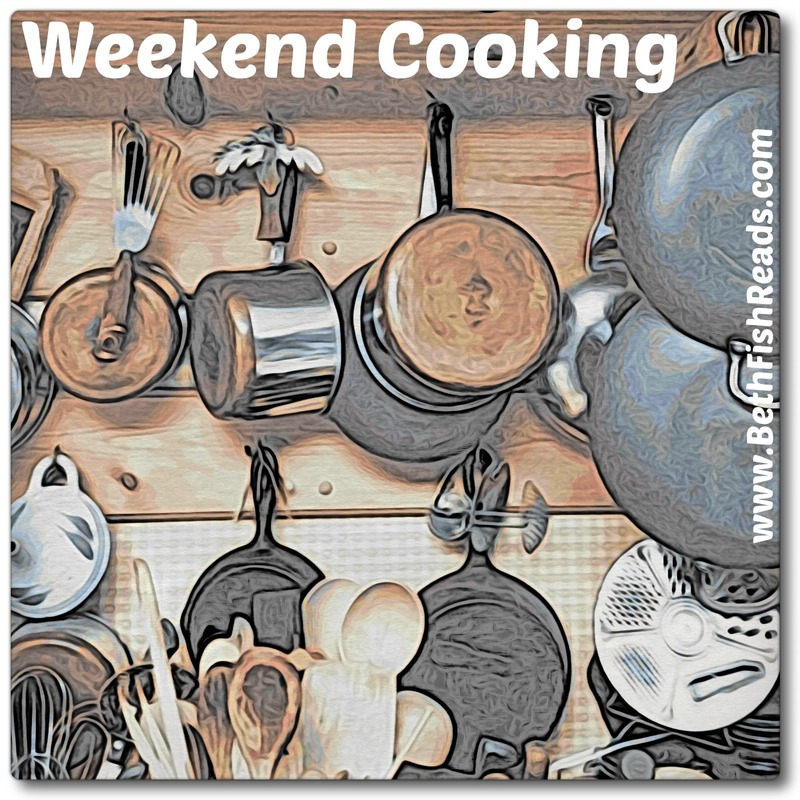 Beth Fish Reads Says: For once, I pretty much followed the recipe exactly. My only changes were to tear the kale instead of cutting it and putting the veggies on the platter willy-nilly instead of making a pretty composed salad. Oh, and I used a tart apple I already had in the house instead of a Granny Smith. What would I do differently in the future? I might add a few toasted pecans, but honestly the salad was perfect just as is. I've never had raw kale either but good to know it blended well, taste wise. Love beets and all the ingredients in this salad. Glad you posted it, especially before Thanksgiving. Definitely a good time for light salads -- a month of heavy eating is blowing our way! Beets and feta together sounds like an excellent idea! Saving this salad recipe, it looks great. I don't eat a lot of raw kale either, but I have some to use up, and this salad makes me think it would go great in any sturdy salad. Thanks for hosting. I'm not usually a beet eater either but since Mr BFR liked this salad, I'd give it a try. Thus far, I haven't jumped on the kale bandwagon. Hopefully this fresh salad will change my mind. Thanks for sharing! I'm glad you enjoyed your girls' weekend and the chicken skillet dinner looks tasty. Happy Thanksgiving to you and Mr. BFR! This looks good! Beets aren't something I've had very often but I'd love to have more of and this looks both fresh and seasonal! Love kale salad! 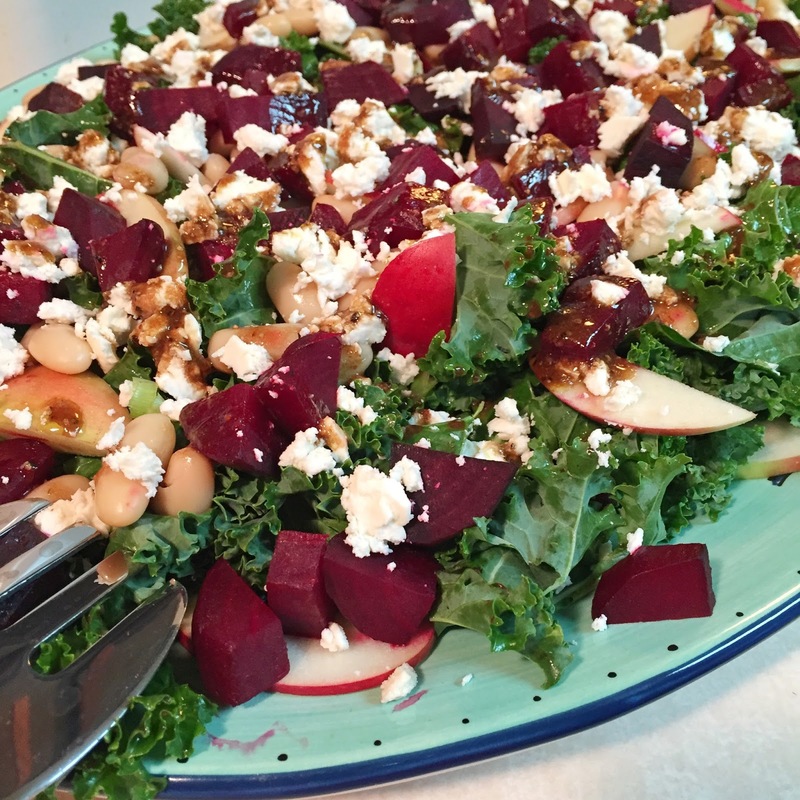 Made a beets and feta salad a couple of weeks ago would add the kale and walnuts to it next time! I know what you mean about craving veggies after being away. I am glad you had fun with your friends and all the lace-making. 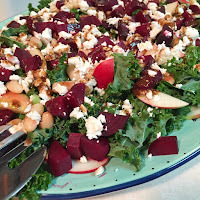 ;-) The salad looks delicious--love the combination of ingredients and the bright color from the kale, beets and feta. It would go well on a holiday table too. I love raw kale salads. I linked up a second post because it has a giveaway for some pretty and fun tea ware that I thought some people might be interested in entering. I don't like beets or feta, but this looks really good so if I do make it, I'll make some substitutions. This salad looks delicious! I usually can stomach kale and beets only in juices, but this looks tempting to eat.